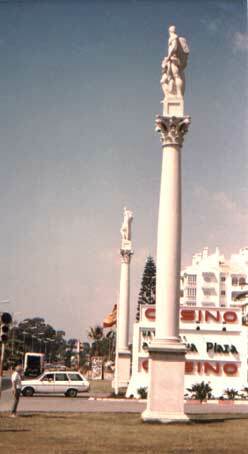 EN EL AÑO 1971 FUE INAUGURADA LA URBANIZACION NUEVA ANDALUCIA, EN EL TERMINO MUNICIPAL DE MARBELLA, PARA LA QUE ANTONIO CANO REALIZO LAS DOS FIGURAS MITICAS DE HERCULES SOBRE COLUMNAS DE MARMOL QUE FRANQUEAN LA ENTRADA A DICHA URBANIZACION. AMBAS FIGURAS HAN SIDO MODELADAS A UN TAMAÑO MAYOR DEL NATURAL, PARA QUE VISTAS DESDE ABAJO NO RESULTEN PEQUEÑAS. COMO CORRESPONDE AL PERSONAJE MITICO, LAS FIGURAS SON DE COMPLEXION ATLETICA, COMO SIMBOLO DE FUERZA, Y EL AUTOR LAS HA MODELADO DESNUDAS, CON CABEZA PEQUEÑA, DOTANDOLAS DE BARBA, Y MIRANDOSE ENTRE SI, CON UNA PIERNA ADELANTADA, PARA DARLE DINAMISMO, MANTENIENDO, AMBAS FIGURAS, UNA POSICION SIMETRICA. EN SU BRAZO DERECHO, SOSTIENE SU ENORME MAZO Y LA OTRA FIGURA, LA TINAJA DEL REY EURISTEO. EN EL BRAZO IZQUIERDO TIENE UNA DE LAS CABEZAS DE LA HIDRA DE LERMA, ASI COMO LA PIEL DEL LEON DE NEMEA, TODO ELLO, COMO SIMBOLOS DE LAS PROEZAS MITICAS REALIZADAS POR EL PERSONAJE. EL MODELADO DE LAS FIGURAS ESTA CONCEBIDO CON VOLUMENES AMPLIOS Y ROTUNDOS, CON PLENITUD Y ROBUSTED, CONSIGUIENDO UN NATURALISMO ACENTUADO, CON UNA RECREACION DE LOS VOLUMENES QUE CONSIGUEN UN CONJUNTO ARMONIOSO Y CORRECTO. ANTONIO CANO, TAMBIEN MODELO LOS CAPITELES CORINTIO, QUE VAN COLOCADOS SOBRE EL FUSTE DE LAS COLUMNAS DE MARMOL. 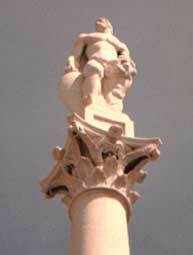 ESTATUAS DE HERCULES SOBRE COLUMNAS. 1971. DIMENSIONES: BASAMENTO: 2,5 mtrs. COLUMNA: 7 mtrs. CAPITEL: 0,90 mtrs. FIGURA: 2,5 mtrs. TECNICA: PIEDRA CALIZA. 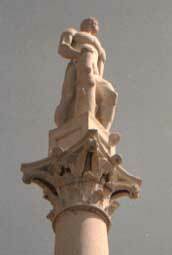 COLUMNA DE MARMOL.